HDCVI (High Definition Composite Video Interface) is an over-coaxial-cable analog HD video transmission standard which developed in-house. The technology renders two HD video formats—1920H (1920×1080) & 1280H (1280×720) by progressive scanning. Composite video/audio/PTZ signals HDCVI composites video, audio and PTZ signals together and have them transmitted over coaxial cable. Upgraded to analog HD seamlessly with Low-cost and simple installation value-added solution. Go after the conventional analog system topology and give a full considerationto users’ operation habit. 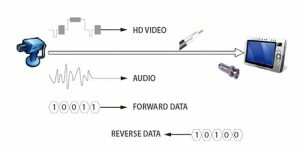 Long range & non-latency reliable video transmission without additions of relay devices. Strong anti-interference capability & solid interface protection. Free of high-frequent electromagnetic radiation; constant signal transmission and display without problems as frame drop and lock loss occurred. An open analog HD transmission system established and evolved industry chain developed to sustainably improve the technical standard. HDCVI is a solution for megapixel high definition applications, featuring non-latent long-distance transmission at a lower cost. The name has to do with its baseband and quadrature amplitude modulation technology, which is able to avoid CVBS cross talk, completely separate brightness and hue signal, and further enhances video quality. The HDCVI solution incorporates both cameras and DVRs. The system is star topology structured — the DVR serves as a node for an over coax P2P (Point-to-Point) transmission to the camera. The technology offers two specifications: 1080p (1920×1080) and 720p (1280×720). In addition, the technology features the Auto Signal Compensation (ASC) patent, which only allows an extremely low signal distortion along long-distance transmissions. Transmitting data over 500m over a coaxial cable can be realized, depending on the cable selected. Cable 75-3 and 75-5 are recommended for transmissions within 500m, cable 75-5 and above for over 500m. Connectors and welding process also affect the transmission distance. HDCVI composites video, audio, and control signals together and then transmits them over one coaxial cable, simplifying installation. To further realize multiple-signal transmission over one cable, both audio and dual-way data communication signals are embedded in a blanking zone. This enhances synchronization with the video signal and supports a max sampling rate of 44.1kHz thanks to ASC. The forward and reverse data channels are composited in the frame blanking zone, realizing a two-way end-to-end transmission to support control commands such as camera focus, PTZ control, real-time alarm, etc. The forward outputting data supports a high transmission baud rate, as the sending time and electric signal baud rate are predictable, and the receiving end is of high ASC performance. On the contrary, the reverse outputting data supports a lower baud rate due to its low signal frequency and limited data, which are affected by impedance matching and channel transmission uncertainty. However, by adopting ASC, the reverse channel can restore some degree of electrical signal during long-distance transmission. AHD stands for analog high definition, AHD is based on AHD standard which developed by Korean chip-set manufacturer – NextChip. HD-TVI was developed by USA company – Techpoint. This new analog HD technology has been deployed into Hikvision’s analog security products. Hikvision takes advantage of HD-TVI technology in order to against Dahua HD-CVI. Both HD-TVI and AHD are open standard, which allows hundreds of manufacturers develop analog security cameras based on these technologies. Dahua developed and promoted the high-definition composite video interface (HD-CVI) which based on megapixel CMOS image sensors with its own in-house image signal processor (ISP).